When there is no witness for the Gospel in a town, village, or tribe, you need a 'man of peace'. Someone whose heart is soft toward the Gospel, who will receive the servants of the Lord and not turn them away. These people are key and we should bless them with God's protection. Lord, You are a shield, and a strong tower. You are a fortress and our hiding place. You are the God over all the earth, and there is no one who can challenge Your power. 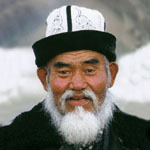 I pray for the men and women of peace among the Unreached Peoples of Central Asia and I ask that you would protect them from the attacks of the enemy. Cause Your angels Lord to encamp around them and keep them from the evil one. Lord I ask that You would protect and preserve their life and not surrender them to the desire of their foes. For the sake of the Gospel among the Unreached Peoples of Central Asia, I ask that You would cover these friends of truth with Your wings, and overshadow them with Your mighty presence.